Card games. I just sat down and was thinking about, a couple of games that where easy to learn for you and your friends, either just for killing time with a new game or for travelling. Games that dont takes up a lot of space in the bags. So you can have them in your handbaggage for a longer flight or up on the deck when sailing and so on. The games i will be talking about in this Post will be the following games. Lets start here by talking about these game one after the other, to let you know more about them. This Is a game where you need to get diseases to win. You will need 6-12 skulls to win in total to be the winner of this game. It take approximately 30 mins to play a full game. So this is easy to play and don’t take alot of your time. If you are on a flight or on a train, even in a bus. With diseases like Elbowia and Itschyballosis, and an Assma epidemic, you should be aware of the terms in this game are not real. But instead Very very funny. And you should be afraid of symtoms like Fear of Pretzles and Excess Earwax are just 2 of the many many symtoms included in this fun little game. So gather your friends and play this fun little game and make sure to get the most diseases and fast, Before your friends get sick. This is another little card game, where you have to build your unicorn army where you will need 6 – 7 unicorns to win the game dependent on how many players you are. 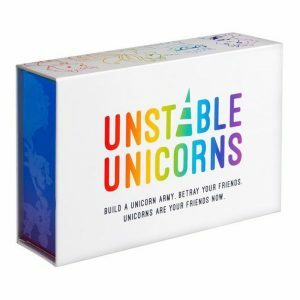 This is a game that requires 2-8 players and they even made special rules if you only are 2 players, these rules can be found at the unstable unicorn own website. You will play your unicorns to your stable and then try to prevent your opponent playing their unicorns to their stable, it is a race to 6 or 7 unicorns, and i tried this alot and it is not so easy as one might think to get 6 or 7 unicorns in your stable. When all your friends is trying to prevent you from doing it so they can win for themselves. You could spice this game up by buyiong the expansions but beware some of them is NSFW. But still quite funny to use and play with. A little quick paced cardgame, that is extremely easy to learn. The other two game mantions are VERY easy to learn. But this game is easier. you basically just play a card and daw a card as simple as that. But there is other rules but that is the basic of it. You will play a card in your turn, and end your turn by drawing a card. If you draw an exploding kitten you are out. There is not enough exploding kitten for all. so the player who did not explode is the winner. You can make this game very strategic. As there is card to play to prevent ytourself from taking a turn. To force your opponents to take a turn and so on. So go try to make your friend blow up. it is a very fun little game this. On a last side note to this post, i can tell you that all of these games are practically as they dont take up a lot of room in your bag, and they dont weigh in, more than maybe 0.5 – 1 kg at the most. And that is a high number for these boxes.